Donald Trump made news last week when he abruptly walked away from two local television interviews after he was asked tough questions from reporters. It's something Trump has done before. 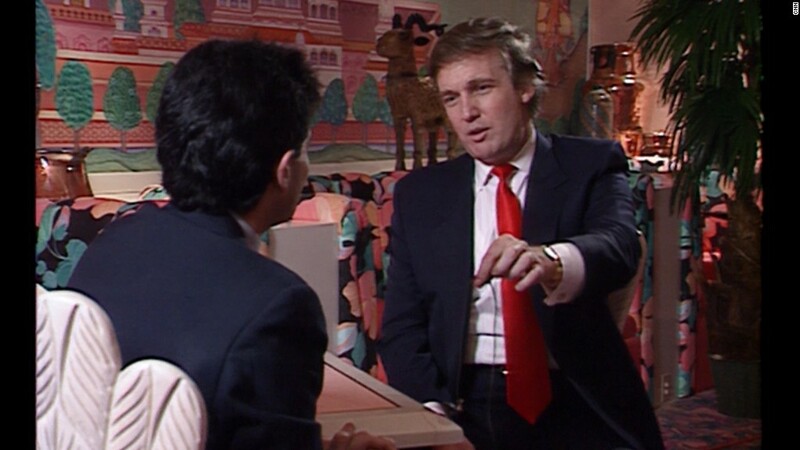 In a 1990 CNN interview reviewed by CNN's KFile, Trump walked off an interview when reporter Charles Feldman pressed him on questions over the financial stability of his Atlantic City casinos. The interview took place in March 1990, just days before Trump's billion dollar Atlantic City casino, the Trump Taj Mahal, was set to open. A week prior, Trump had publicly lambasted Marvin Roffman, a financial analyst who predicted to the Wall Street Journal that Trump's new casino would not be able to survive. Trump immediately retaliated by threatening to sue Roffman's employer, Janney Montgomery Scott LLC, unless he apologized or was fired. "When this property opens, he will have had so much free publicity he will break every record in the books in April, June, and July," Roffman told the Journal. "But once the cold winds blow from October to February, it won't make it. The market just isn't there." Within days of the Journal quote, Roffman was let go from his firm. Roffman talked about the ordeal with CNN's Gloria Borger in an interview this year, saying, "I was putting a tarnish on the Trump brand. That's an anathema to Donald Trump. You don't do that," Roffman said. In the 1990 interview, Feldman pressed Trump on some of the dire predictions being made about the casino. Trump dismissed the negative outlook. "Most analysts believe it's going to be very successful, there are always going to be analysts who say, 'well, maybe not, who knows?'" Trump said. "I think it's going to be so beautiful a building, and it turned out to be so beautiful a building, that everybody is going to come. The world is coming to see the Taj Mahal." Feldman pointed out that other analysts he had spoken to voiced similar concerns as Roffman, causing Trump to lash out at the reporter. "You aren't going to talk about positive people. You'll talk about the negative. You want to talk about the negative." After more back-and-forth about the tone of Feldman's questions, Trump announced the interview was over. "Do the interview with somebody else. Really. You don't need this. Do it with somebody else. Have a good time. Frankly, you're a very negative guy, and I think it's very unfair reporting. Good luck." In July of 1990, four months after Roffman was fired and Trump walked out of his CNN interview, Roffman sued Trump for libel — a lawsuit which Trump ultimately settled. Though Roffman signed a confidentiality agreement barring him from discussing the size of his settlement, he told Politico in a story this year that he was "extremely happy" with it. In July 1991, the Trump Taj Mahal entered Chapter 11 bankruptcy.